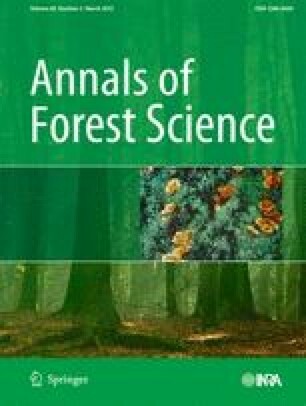 Functional–structural models (FSM) of tree growth have great potential in forestry, but their development, calibration and validation are hampered by the difficulty of collecting experimental data at organ scale for adult trees. Due to their simple architecture and morphological properties, “model plants” such as Cecropia sciadophylla are of great interest to validate new models and methodologies, since exhaustive descriptions of their plant structure and mass partitioning can be gathered. Our objective was to develop a model-based approach to analysing the influence of environmental conditions on the dynamics of trophic competition within C. sciadophylla trees. We defined an integrated environmental factor that includes meteorological medium-frequency variations and a relative index representing the local site conditions for each plant. This index is estimated based on model inversion of the GreenLab FSM using data from 11 trees for model calibration and 7 trees for model evaluation. The resulting model explained the dynamics of biomass allocation to different organs during the plant growth, according to the environmental pressure they experienced. By linking the integrated environmental factor to a competition index, an extension of the model to the population level could be considered. P.H., P.C.Z. and E.N. designed the experimental protocol; V.L., P.H., E.N. and P.C.Z. collected the data; V.L. and P.H. designed the model; V.L. programmed the model and fitted the parameters; V.L., P.H. and P.C.Z. wrote the manuscript; P.H. and P.R. coordinated the research project. The authors thank the students who helped us with measurements during the training program FTH organized by AgroParisTech, Kourou (UMR Ecofog): V. Bellassin, S. Braun, O. Djiwa, V. Le Tellier (FTH 2007), L. Menard, A. Jaecque, K. Amine, J. Kaushalendra (FTH 2008). We also thank B. Leudet, J. Beauchêne and F. Boyer for their help in the field, P.-H. Cournède for the use of the Digiplante software (Ecole Centrale Paris—INRIA Saclay, EPI Digiplante), and C. Sarmiento for her valuable comments on our manuscript. This research was supported partially by an Ecos-Nord Colciencias and Paris 13 University grant (C08A01), and by the AIP INRA-INRIA of the Digiplante team-project (2008).